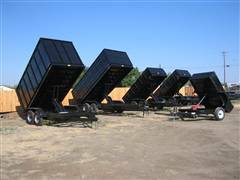 Fold down sides - 2' high - Must have the over the wheels flatbed 8' wide option . Add: $1290.00 for 12' long trailer - Add $1490.00 for 14' long trailers - Add $1690.00 for 16' long trailers. Recessed “D“ Ring Tie Downs - add $45.00 ea.